Asajj Ventress is a minifigure based on the Dark Jedi of the same name in the Star Wars universe. Ventress was first released in the year 2008, for the Star Wars: The Clone Wars theme. Ventress' first variant has plain dark blue legs, with a dark blue torso that has plain light blue arms and white hands (mimicking the character's skin colour). The torso has printing on the front only, with different shades of blue for the detailing of Ventress' clothing and a white section near the top of the torso to depict skin. A grey belt with a red clasp and black outlining is also printed at the bottom of the piece. This minifigure's white head piece contains purple markings above the eyes, around the lips, and also on the back of the head. The eyes are outlined in black and have eyelashes printed, and also have light blue irises with black pupils. The lips are a dark red, and grey lines are also used to provide extra detail. 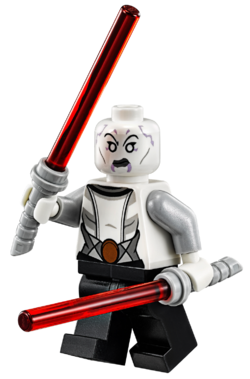 As Ventress is bald in the Star Wars universe, this minifigure does not have a hairpiece. Two types of accessory are used on this minifigure- a felt black skirt can be inserted between the leg and torso pieces, and two long, curved-hilt red-bladed lightsabers are used as weapons. The hilt pieces are a plain light grey, and were made especially for this minifigure. In 2011, another version of the Dark Jedi was released, with a design based upon Ventress' appearance in Season Three of The Clone Wars. The minifigure has black legs with dark blue printing on the legs and the hip joint, along with some silver printing which is used in three places, most noticeably on the hip joint for the bottom of a circular belt clasp. The torso piece is also black, but has light grey arms and white hands. Printing is present on the front and the back of the piece- silver is used on the front to complete the belt clasp and the dark blue design which started on the leg piece, with different types of grey used for detailing and for the centre part of the clothing. The back part uses the same greys and dark blue as on the front, extending on the design. This variant's head piece is the same as the original, as are the lightsabers, however no removable skirt is included. Ventress was included in the set 75087 Anakin's Custom Jedi Starfighter, based on her appearance in the 2003 Star Wars: Clone Wars mini-series. Her head is white with grey printing detailing her cheekbones, and purple printing detailing her head tattoos. Her eyes are now more conventionally shaped, but with white eyes with black outlines for her eyes. Her facial expression is an angry one. Ventress' torso is white with printing detailing her grey and white suit with a grey belt with a red buckle. Ventress' legs are blain black, her arms are light grey and her hands are white. She has her red-bladed curved lightsabers, just like her previous variations. Asajj Ventress is a playable character in LEGO Star Wars III: The Clone Wars. Her appearance is based upon her original minifigure, however black eyes with white pupils replace her The Clone Wars eyes. She has several abilities, including being able to double-jump, attack with her lightsabers, perform a lightsaber throw, use the Force on objects (including objects which can only be interacted with if the user is aligned with the Dark Side of the Force), choke enemies with the Force, cut through certain walls with a lightsaber, and wall jump up certain areas. Asajj Ventress was a Dathomirian Dark Jedi who initially served Count Dooku throughout the Clone Wars. Ventress led several assaults for the Separatists against the Jedi and the Republic, including the Battles of Christophsis and Teth, and leading an attack on the clone trooper homeworld of Kamino with General Grievous. However, Dooku's Master Darth Sidious, sensed that Ventress was growing too powerful, and ordered Dooku to kill her. The Sith Apprentice complied, ordering his ships to fire on her, thinking that she had died. However, Ventress survived, returning to Dathomir and the Nightsisters. Seeking revenge on Dooku, she hatched and carried out several assassination attempts on him. When the second one failed, and it became apparent that even with the help of Savage Opress, she could not overcome Dooku, Ventress fled to an escape pod. In her first LEGO Club Magazine appearance, she is shown in an illustration with Anakin Skywalker's body printing on a printer. Although in the Sith Nightspeeder some people call Ventress's outfit a "Nightsister outfit" her outfit is actually from a time when she was a Separatist. 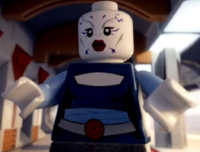 In The Padawan Menace, Ventress retains her dot-eyes as seen in LEGO Star Wars III: The Clone Wars. 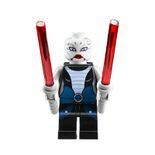 Asajj Ventress in LEGO Star Wars: The Padawan Menace. This page was last edited on 20 August 2016, at 21:17.